A breakthrough in engineering, the exoskeleton is a state of the art technology brought to life by Dr. Barbar Akle and a team of engineering students at the Lebanese American University. It is cutting edge in its ability to provide a paralyzed person the sufficient balance to be able to stand-up and later walk and climb stairs. The fact that the exoskeleton relies solely on the individual’s body energy, rather than using external energy sources like a motor or batteries, makes the design lightweight, cost effective, and a more aesthetically pleasing choice. This mechanism is also a healthier way of mobility for one constantly sitting in wheelchairs. The exoskeleton was first tested on Michael Haddad, a young man with a T4-T5 spinal injury who managed to come up with his own unique way of getting around. In coordination with Michael and Phoenix Industries, the LAU’s engineering students are continuing research on the exoskeleton to further develop it to accommodate more activities of paralyzed individuals such as climbing stairs or walking longer distance. To raise funds for the continuation of the research and construction of the exoskeleton, LAU’s Survival Team will hike up Kilimanjaro Mountain (5,895 meters), Africa’s highest peak in North-East Tanzania. 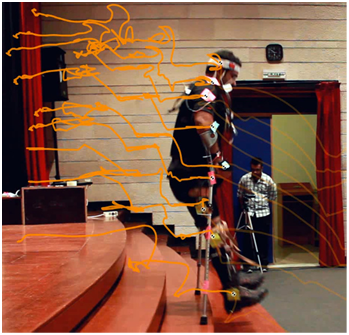 On August 28, 2014, the LAU exoskeleton team performed the first round of testing with Michael (Figure 1). The experiments demonstrate that Michael’s genius lies in his ability to balance himself using his upper active body. Ongoing studies and computer simulations are proving that this voluntary exercise is very difficult for a regular person to perform. Figure 1: Photo of Michael during an experiment at LAU. The motion and acceleration of his limbs are being tracked and recorded. The first goal of the proposed work is to provide the paralyzed person the needed balance to stand up and later walk. 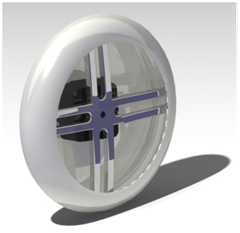 The team is examining several options to augment the balance using lightweight and slim mechatronic systems. In later phases, the balancing patterns of the system will be adjusted to accommodate walking and other locomotion activities. The second goal of the project is to improve Michael’s current primitive exoskeleton. Similar to regular humans, the improved design will allow Michael and other future users to recover part of the energy spent during walking. The proposed design will be made of lightweight carbon fibers and will include springs, shock absorbers and possibly active devices such as motors and smart materials. The current heavy stainless steel exoskeleton is not ergonomic and causes injury to Michael’s legs during excessive activities. Furthermore, the testing demonstrated that Michael is experiencing large shock forces when he is descending stairs. The measured deceleration was approximately14g (14 times the acceleration of earth’s gravity) on his legs and 8gon his chest. These are dangerous high forces with negative health consequences. The proposed exoskeleton will enable the person to move longer ranges while reducing health risks. Michael’s next challenge is walking the North Pole; this endeavor requires the energy recovery, vibration absorption and other features that will be installed and ultimately tested in the improved exoskeleton. Compared to competitor exoskeleton systems under development, the proposed design offers several improvements. Most improvements stem from the fact that the user of the proposed exoskeleton will rely on his energy to move rather than external motors and batteries. Moreover, it will allow longer walking range and most important it will be a healthier option for most users who can benefit from a daily exercise. The low cost aspect is very important knowing that 100 million people worldwide need a wheelchair but cannot afford one! Figure 2: Proposed design of a reaction wheel balancing mechanism. 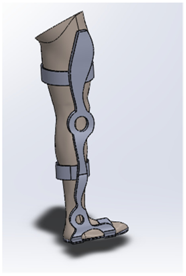 Figure 3: An ergonomic design of the exoskeleton designed specifically to Michael's leg. Springs will be added to the knee and ankle joint.